This article is shared with permission from our friends at crunchybetty.com . Gardens come in all shapes and sizes, but they tend to be on the bigger side. For those of you who have a green thumb but struggle to maintain a large patch of dirt, this is the perfect combination of gardening, low-maintenance and space conservation. This concept actually came from something I pinned a million years ago. 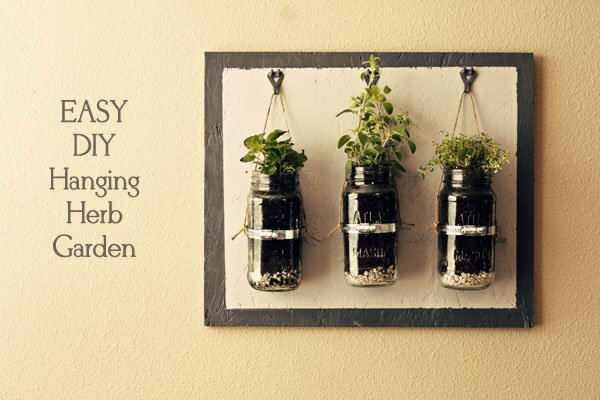 Growing your favorite herbs in lovely little mason jars is the perfect way to turn your garden into beautiful home decor. The cool thing, though, about my little concept, is that it cost about $7 total to make (not counting the seedlings – with the seedlings the total was about $25). I bought the glass mugs at the dollar store. You can also look for yours in a thrift store. They will sometimes have good deals. Paint the majority of the board the lighter color and then let it dry. After it is completely dry, tape off the straight lines for the edges and paint the darker color along the edges and sides. Let that dry completely. 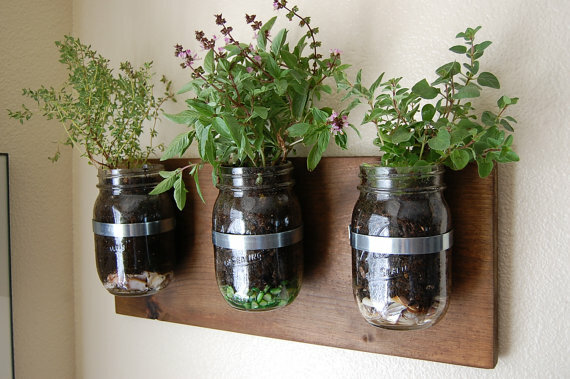 In the meantime, plant herbs in the jars, making sure to use small rocks at the bottom for drainage. Secure the hose clams to the jars and tie the twine to each side. Measure carefully with your eye to make sure that the jars will hang as level as possible. Using this measurement, determine where the hooks should go and then secure them to the board. Take your hammer and hammer in the picture hangers to the back. Hang it on the wall. Attach the mason jars to the hooks. Voila! Your very own hanging garden. Here are some more great DIYs for gardening – Grow Your Own Avocado Tree and 7 Garden Hacks. Crunchy Betty is passionate about natural solutions and avoiding the use of chemical-filled products. Her website offers tips and tricks on homemade beauty recipes, household cleaning ideas, green and conscious living, and food.